Women’s tennis has been having a tough season, playing some of the best schools nationwide in the ACC. This past weekend, Louisville hosted No. 3 Duke and No. 17 Wake Forest and lost both matches. The Cards are now 10-9 overall with a 2-7 conference record. The doubles lineup consisted of freshman Dina Chaika and senior Sena Suswam at the No. 1 spot, juniors Raven Neely and Diana Wong at the No. 2 spot, and freshman Chloe Hamlin and redshirt senior Aleksandra Mally at No. 3. Court three finished first falling 6-2, followed by another 6-2 loss on court one. With two of the three doubles matches lost, the Blue Devils secured the doubles point, leaving the match on court two unfinished at 4-5. Going into singles, Duke already had an advantage with a 1-0 lead. The Cards didn’t have anyone playing at the No. 6 spot due to an injury, so Duke added another point to its tally automatically, giving them a 2-0 lead. Louisville suffered its second singles loss on court four with a score of 6-0, 6-1. Next came in Dina Chaika at the No. 5 spot with a 6-2, 6-4 loss to Hannah Zhao (DU). No. 3 Raven Neely put up a notable fight, but ultimately fell to Meible Chi (DU) 5-7, 6-3, 2-6. Courts one and two were also taken over by the Blue Devils, giving them a 6-0 win over the Cards. In their match against Wake Forest, the doubles lineup was the same as previously. No. 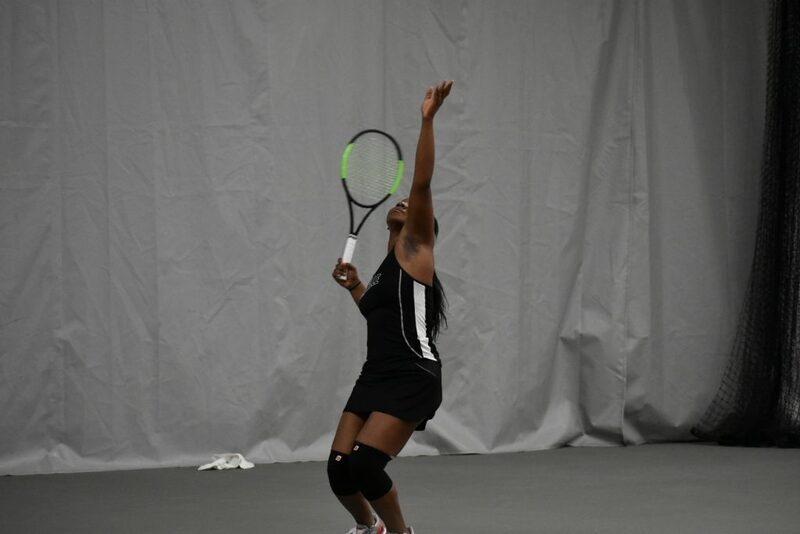 1 Suswam and Chaika fell to 28th-ranked Chandler Carter and Emma Davis (WF), followed by a win from Hamlin and Mally on court three, making the match on court two the deciding factor for the doubles point. After a hard fight, the No. 2 team fell, giving the point to Wake Forest. No. 4 Raven Neely won her match 6-2, 6-3, but from there on it was downhill for the Cards. No. 32 ranked Emma Davis (WF) defeated Sena Suswam on court one with a score of 6-1, 6-4. Courts two, three, and five fell to Wake Forest, handing the match to the Demon Deacons. Finishing last was No. 6 Dina Chaika losing in the third set (0-6, 6-3, 0-6), making the final score 6-1. The Cards host Boston College on Sunday, March 31 at 10 a.m. at the Bass Rudd Tennis Center.